Traditional wooden shutters on the inside. Open plan lounge & dining room. Fully fenced with a gate. The entire house was finished to a very high standard using the latest materials and excellent workmanship. The property is detached, seats in a very private spot in the countryside and is very well connected by roads perfect to explore the region, with added bonus of being in central Portugal it means you have the coast at 1 hour and the snow in 2, perfect to explore and getting back home. The owners have kept all the house wonderful internal stone features in the large lounge with a large fire place providing lots of character. The kitchen is fully fitted. The property consists of: 3 bedrooms, the lounge is spacious with a character stone wall and has a large fire place. Above 2 of the rooms there’s a mezzanine area with enough room for an extra bed if required which the current owners use a computer room. There is 1 shower room with WC and washbasins one. There’s also an utility and storage room on the outside. The Kitchen is perfectly placed to access the outside covered patio area and the living room via a stone arch. This property has lots of character and it’s in the market at a bargain price, greatly suitable for those looking for a quality holiday home in the countryside or even away from city stress. There’s a very suitable spot for a reasonable size swimming pool and quotations can be given on request. The property is situated near the villages of Cabacos and Areias, which have several amenities such as cafes mini-markets, health centre, banks, post office, butcher, petrol station, pet/agricultural supplies and builders’ yard. Each Monday, there is a small market in the village selling bread, fruit and vegetables, plants, shoes and clothing. 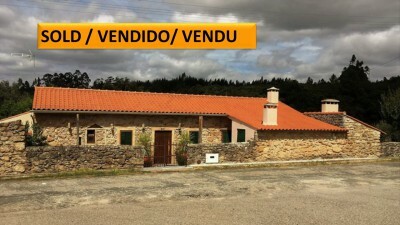 The house is approximately 10minutes by car from the town of Alvaiazere and 15 min from the town of Ferreira do Zezere which offer a range of services and amenities such as, restaurants, cafés, market, banks, medical centre, post office, pharmacy, Police station, Registry office, Tax office, Court room, Indoor and Outdoor swimming pools, full size football pitch, athletics running track and more. The historic town of Tomar, which is home to the UNESCO listed Convento do Cristo, founded by the Templar’s crusaders is only 20 to 25 minutes drive from the property. All major European high street shopping is also available in the city of Coimbra the 3rd biggest city in Portugal which is only 40 to 45 minutes drive on the A13 motorway. There are also very good access roads to the IC8 dual carriageway, which leads to the coastal towns of Figueira da Foz and can be reached by car in approximately 1hour 10 min. The closest airport to the property is situated at Lisbon, which is approximately one and half hours by car.